Flagstone Pavers, Inc. was founded in October 1999 after careful research of the industry. This research involved learning both what customers needed from their supplier and the production processes available to produce quality concrete pavers. By April 2000 the land where the manufacturing plant would be built was purchased and the production equipment was ordered. After receiving rezoning and the building permits, construction began in September 2000. Flagstone Pavers began testing the production equipment by the end of March 2001 and had successfully proven the batch design, color formulas and color blending techniques by the end of May 2001. Sales to our customers began in June 2001 and have steadily grown since that time. True to their word, many customers found the unique shapes that Flagstone has to offer and the well blended colors a nice option to the traditional shapes and colors. 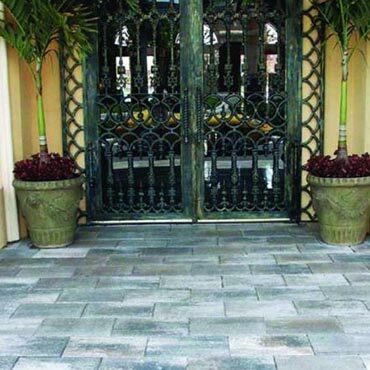 As the months and years have gone by Flagstone Pavers has added new colors to keep up with the ever changing and variety demanding Florida marketplace. Flagstone Pavers was founded on the basis that we would be a paver manufacturer first and due to the demand for our products have stayed this course. While the opportunities to make other concrete products are there, we will not add these product lines so that we can be the best at what we are currently producing…Concrete Pavers, Coping, and Turf Block. Flagstone Pavers has expanded its property to 20+ acres. To further support our customers and to meet the ever increasing demand for Flagstone Pavers, we are constructing Plant #2! This plant, which will be in operation in early 2007, doubles the companies current production capacity. We are continuously looking for innovative ways to assist our clients and improve our services. Our "Open Order Report" program, which was recently implemented, is an innovative way of communicating with our customers about the status of their orders. If your project, whether it be new construction or remodeling, requires hard surfacing, contact Flagstone Pavers to learn more about the benefits of concrete pavers. We will be glad to assist you in selecting the best products for your application and can recommend a qualified installation company, if you do not already know one.